As you work, you drawing can get complex and contain multiple strokes. You may want to optimize those drawings to reduce the number of brush strokes, pencil lines, and invisible strokes. You may also want to flatten your artwork or optimize your brush stroke textures. The Optimize command reduces the number of layers, such as overlapping brush strokes, in the selected drawing objects. 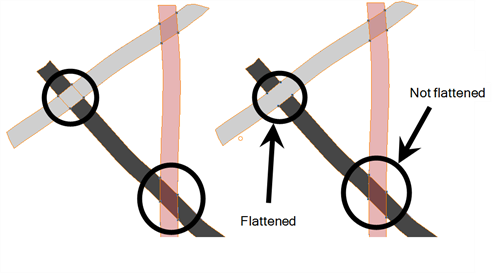 Drawing objects will only be flattened and optimized if the selected objects do not change the appearance of the final image when they are merged. For example, if you have selected a number of partially transparent objects, which you layered to create an additive colour effect, the selected transparent drawing objects will not be merged. This is because merging the transparent drawing objects will cause them to lose the effect of the layered transparent colours. You could also want to add invisible contour strokes so that if you unpaint lines, the vector container remains to be repainted later.